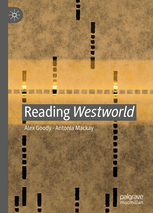 Thrilled to have delivered a chapter for Reading Westworld, a book on the HBO Series, edited by Antonia Mackay and Alex Goody, due for publication through Palgrave Macmillan later in 2019. My piece is on the use of music and sound design in the show, and specifically how composer Ramin Djawadi’s score for Westworld made use of both original music and a number of instrumental covers from an array of artists that included Soundgarden, The Rolling Stones, The Animals, Amy Winehouse, Nine Inch Nails, The Cure and Radiohead. Each of these musical cues, described by Djawadi as “piano reductions”, was transcribed onto perforated paper rolls by specialists Gnaw-Vol-ty Music Rolls and rendered diegetically by a player piano situated within Sweetwater’s Mariposa Saloon, a central location of Westworld’s theme park. The player piano serves as a part of Westworld’s title design and has been described by the show’s creators as a “touchstone image” in that it reflects the core themes of the narrative. 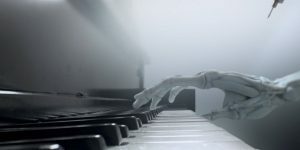 The piano serves as metaphor for the shadow of human control over the park’s robotic ‘hosts’, and the desire of the park’s creator for these robotic inhabitants to break free of their programming in order to reach self-actualisation and sentience. of cinema, literature, mythology, theology and fine art. For the piece, I’ve interviewed the show’s producer Stephen Semel, music editor Chris Kaller and co-creator/showrunner Jonah Nolan.